The image below shows the result when using CODE-Y below. Notice that both the Manually typed Excerpt and the Auto-generated excerpt are present. Create a Variable Length Excerpt in WordPress Without a Plugin. Remove Header Tags and Their Content in WordPress Excerpt Without a Plugin. Preserve HTML Tags in WordPress Excerpt Without a Plugin. Improve WordPress Excerpt Without a Plugin. 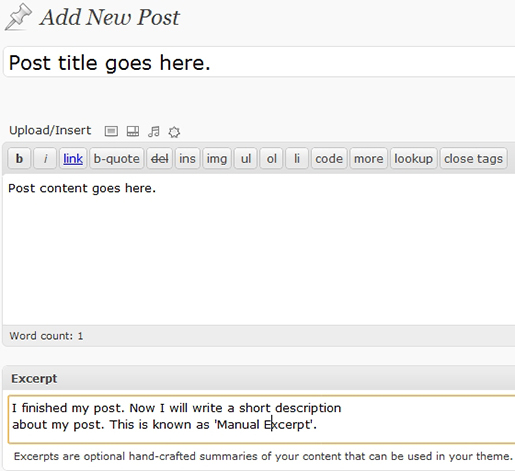 The relationship between the Manual Excerpt, Automatic Excerpt, and Teaser is this: When a post has no manual excerpt added to the dashboard and the post template uses the_excerpt() tag, WordPress automatically generates an excerpt by selecting the first 55 words of the post followed by the unlinked ellipsis “[...]”. When the post template uses the_content() tag, WordPress will look for the More tag and create a teaser from the content that precedes the More tag. However, if a post has a manually added excerpt, then WordPress, by default, will display the content of the manual excerpt instead. However, in this case, the manually added excerpt will be returned untouched, with formatting if it exists. It will not be shortened. The Advantage of a Manual excerpt is that it is often used by search engines to describe search results. In this CASE, good excerpts increase Website traffic. Another major drawback of the auto-generatic excerpt is that the beginning of a post is usually an introduction and not a summary. In WordPress, if you do not provide a manually typed excerpt to a post, WordPress will display an automatically generated excerpt. By default, WordPress display the excerpt with the first 55 words of the post´s content, an un-linked ´[...]´ string at the end, and the text will be unformatted. This makes the excerpt one text paragraph without any line breaks. No extra Plugin to your Blog. Caution about adding plugins to your theme. The code takes care of both scenarios: The manually added excerpt and the automatically generated excerpt. You can have both a manual excerpt on one post and and auto-generated excerpt on another post. Option to add a linked anchor to the end of the Excerpt. Option to add an un-linked Ellipsis ([…]) to the end of the Excerpt. Option to control the excerpt length. However; the code strips all HTML formatting in the excerpt. To add CODE-Y: Open functions.php file located in your current theme´s folder and add (copy and paste) the following CODE-Y. Save the file and upload it to your server. *  generated Excerpt at the same time. CODE-Y works for both the manually typed excerpt AND The automatically generated Excerpt. If there is a manual excerpt in the dashboard it will be displayed at the main page of the blog. 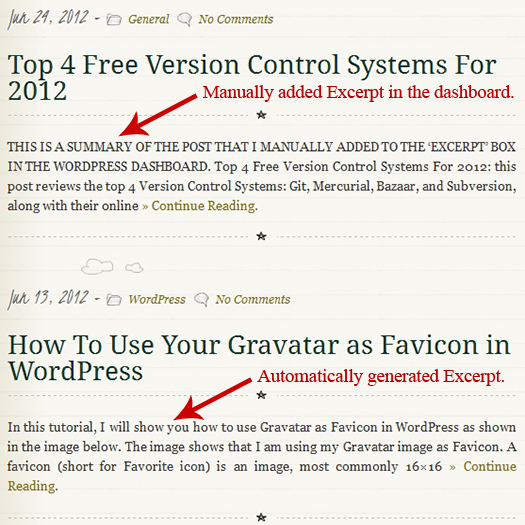 If there is no manual excerpt added, then the auto-generated excerpt will be displayed at the main page of the blog. For the Auto-generated excerpt: Watch out: If you are using the <!–more–> tag in your post content, make sure that it resides outside your defined excerpt length. If there is a More tag in your post, then the excerpt word count stops at either where the More tag is placed or it stops at your defined excerpt length whichever comes first. For the Manually typed excerpt: Watch out: If you type a shorter excerpt in your dashboard, than the length defined in the code (line 22 of CODE-Y), then the excerpt displayed will not show the excerpt_end as defined in line 25 of CODE-Y. CODE-Y works on WordPress 3.3 and higher. But I hope that you will always upgrade to the latest version. CODE-Y does NOT preserve any HTML formatting in the Excerpt, be it manual or the auto-generated one. The trick in this code is to use the wp_trim_words() function instead of wp_trim_excerpt(). CODE-Y is set at the Excerpt length of 45 words. If you like to change the Excerpt length, then find line 22 and replace it with the integer that you wish. Keep the length reasonable. If CODE-Y is not responding in your theme, make sure that the_excerpt() function exists in your theme´s index.php file. You can also check its existence in archive.php and search.php files. Never show full posts in the main page. In your theme, If you have the_content() template tag, make sure to use the More tag in your post. They work together, otherwise your posts will be shown in full in the main page which can dramatically increase page loading time. One way to reduce page load time, is to replace the_content() template tag with the_excerpt() template tag. //The '...' can be anything (or nothing) inside. NOTE: the_excerpt() template tag has no parameters. However, there is no harm from keeping them in case you wanted to revert back and use the_content() again. If you get any errors, then replace the_content(‘…’); with the_excerpt();. To EMPHASIZE: the_content() template tag is used in conjunction with the More tag. Make sure to place the More tag somewhere at the beginning of the post. Otherwise, the whole content of the post will be displayed. In this tutorial, I showed you how to automatically control the Manually typed Excerpt AND also the Auto-generated excerpt at the same time, without the need of a plugin. If you have any questions or anything else to say, please share your opinion in the comments section. Your opinion matters, unless it is a Spam. I just read your articles on customizing the WP excerpt without a plugin, and I think they are really close to what I need, but not quite. I have the excerpts that show on my homepage set up the way that I want them, limited to 70 words, with a Read More link at the end and no img tags because a featured image thumbnail automatically displays because of my theme. And I would like to leave those automatic excerpts exactly the way they are, but I would like to be able to manually create an excerpt for each post as well and send that excerpt to my RSS feed. I want a longer excerpt that includes the first image in the post shown in my RSS feed, but when I’ve tried to change that, it also changes the excerpt that shows on my homepage or category, tag, and archive pages. Is there a way to leave automatic excerpts everywhere on the blog and send the manually generated excerpt to the RSS feed? Also, I am lately involved with Drupal CMS. site with separate blog located on the menu. which I have no idea how to prevent this happening, arghhh! can get a thumb nail image to show ok .
within about 70 words each time. page and featured left, right and bottom…..
quite a few as well etc and it’s not been updated for two years! Hi, VERY nice script… Works perfectly with 3.4.1! One question: Is there a way I can use the original manual excerpt, without trimming it? 59 queries in 0.368 seconds.